My blind Border collie went missing during a snowy December in New Hampshire. I never would have found him without some expert advice. Rueben was gone for 8 days. I had left him in the house while I went to a craft fair. He ripped a dog door off the wall and climbed out over 2 fenced areas. He started to follow a pick-up truck; I'm sure thinking it was me. He followed it too far, and was out of his home range. When I got home,Rueben was missing. I had a message on my answering machine from our Animal Control Officer. She knew I had Border collies and a Border collie had been seen running toward town. I headed toward town, calling him and thought I could find him easily, but as it grew dark and no dog, I started to panic. The next day I started again. I made flyers and put them up everywhere. I talked to the people who ran the general stores in town. I drove around calling Rueben's name. I whistled. After many hours, I came home. I got online. I sent out emails to everyone I could think of. I posted on Facebook. I sent out messages to every list I knew of. I called vets, dog officers, and shelters in all the surrounding towns.I talked to our local dog officer again. She said a snowplow driver had seen him the night before crossing the highway. He almost hit him but he managed to avoid him at the last minute.. At least I had an area to concentrate on. Our ACO also told me about a woman in Massachusetts, Debbie Hall, who specialized in finding lost dogs. She gave me her email address and I sent her a message. She not only answered me but gave me all sorts of tips, some I had already tried, but others I hadn't thought of. That evening I went out again. No sign of him. The rest of the week followed the same pattern. I couldn't find anyone who had spotted him. I searched and searched. I got a map of the town and went down every road calling and whistling. I put a big sign on the back of my truck that said, "Dog Search." I made business cards with his picture and my phone number on them and passed them out to everyone I met. I was terrified that he would wander onto the highway. Since he was blind, he could easily be hit by a car. I would have settled for finding his body. At least I would know what happened to him. I would come home at dark and sit in the driveway and cry. I was afraid I would never see my sweet boy again. But Debbie had said that most owners give up too soon. I had to keep trying. I read more of Debbie's articles. After the most miserable week of my life, I realized that the little 8 1/2 by 11 flyers I had posted everywhere were totally unreadable to anyone in a car. And being a rural area, most people went by in cars. So I went to the store and bought some stiff poster board. I cut the poster board in half. I printed out pictures of Rueben on 8 1/2 x 11 sheets of paper and glued them to the poster board. I used a wide tip marker to put just the basics - lost Border collie, do not chase, call........ I sprayed them with a spray varnish so they wouldn't run if they got wet and I put those up. Since Rueben had run on my dogsled team, it seemed possible that he might be traveling on the nearby railroad bed where we had trained. I decided to take the team out and see if I could spot him along the trail. We hitched up and ran down the trail with me calling for Rueben. Nothing. I brought the dogs home, unloaded and went into the house. My answering machine was blinking. I had a message that someone thought they had spotted Rueben. I was shaking as I made the call back. . A woman said she thought she had seen him trying to get into their garbage. (Lost dogs are usually very hungry.) She had seen one of the big posters I had put up right across the street from her. I asked if she could put some food out for him but not to try to call him or chase him. I knew he was very frightened and would run. I jumped in my truck and raced over to her house. I saw a black and white dog on her porch eating some food she had put out. It was Rueben. I jumped out of the truck and called him. Not all dogs will even come to their owners if they're lost and frightened, but Rueben did. I sat in the middle of the road hugging him and crying. She came out to meet me and gave Rueben half of the sandwich she had in her hand. He snatched it from her. He was one hungry dog. When I got him home, I fed him, but not much. It takes time for them to adjust to having food again. I was told to feed him several small meals a day until he started to gain weight again. He had lost 10 lbs. He was a 50 lb. dog who now weighed 40 lbs.I groomed him and just wanted to touch him to let him know I was there. I called all the vets, dog officers and rescues to let them know he had been found. I drove around and pulled down all the posters. I put up a flyer in the general stores thanking everyone who had looked for him and that he was home. I was, and still am, so grateful to the people who helped me find Rueben. It takes a community to find a lost dog. Debbie Hall gave me such support and good information, I'd like for anyone who has a dog to know about her site, Lost Dog Search. Our local ACO was instrumental in helping. She's the one who put me in touch with Debbie Hall and encouraged me during the long days of searching. I'm grateful too, for all the ACO's. 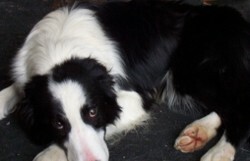 vets, and shelter people in nearby towns who kept an eye out for a big, blind Border collie. I can't forget all the people in our little community who kept looking for Rueben. That's what finally made it happen. One person recognized him and made the call.. I cry every time I think about it. I wrote this hopefully to help others who might have lost a pet. Micro chipping and ID tags don't help when a dog is afraid to come near people. And at least I knew. The worst is not knowing. You really would think that dogs could figure out how to track their own way back home. It is a horrible feeling. I'm really glad you got her back too. I do love a happy ending. He was my old sweetie. I was so happy to have him back. I am glad it all turned out well for you and Rueben. He sure looks like a great dog and friend. Thanks for sharing all the tips for all the dog searchers. Thanks. I leaned so much about finding them. I wanted every dog owner to know there is help out there. This is such a great story. I have four dogs and know how devastating it is to lose your best friend.